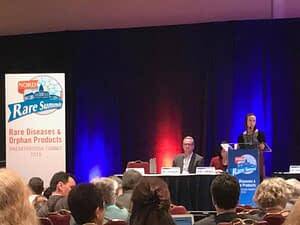 I was very happy to be able to attend the 2016 Rare Diseases and Orphan Products Breakthrough Summit, which kicked off today with record breaking attendance, bringing together 600 patient advocates from all areas of rare diseases. While the majority of rare diseases are neurological and pediatric based, they are somewhat different than myocarditis which often strikes and takes the person in the blink of an eye. Just like myocarditis, we all have the same roadblocks…misdiagnosis, lack of awareness, need for funding, and time (to be diagnosed and treated before decline). 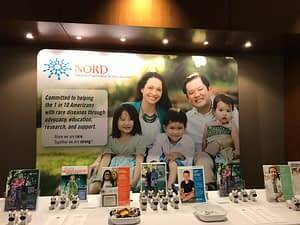 This year there was a round table breakout luncheon where I networked with others about the importance of educating the medical community on your rare disease. The Collaborations Across Borders panel endorsed patient-driven registries to collect natural history data and suggested a global depository system to expand access and care across the globe. Tomorrow, there will be many speakers from NORD throughout the day touching on items such as State Based Advocacy as well as National Based Advocacy, Health Partnerships to Improve Quality of Care and Outcomes, among others.